The Nawegaon-Nagzira Tiger Reserve forms an important corridor connecting Pench and Kanha (M.P.) in the north to Tadoba and Gadchiroli (Maharashtra) forests in the south. More than 3600 small and big lakes in the area attract high numbers of migratory birds. Besides, there are several cases of young tiger sub-adults who have used the existing corridors to migrate to nearby parks. 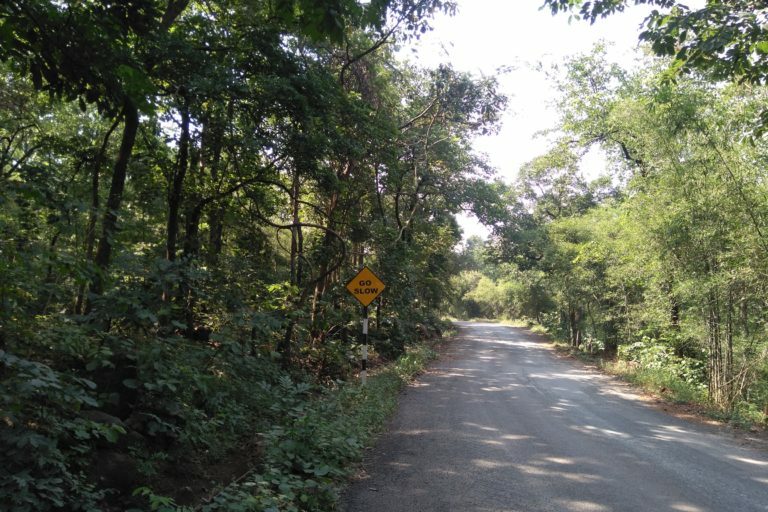 In this commentary, Kunal Sharma writes about the dangers surrounding these remnant forests and hopes that the remote location and protection is sufficient for the forests to continue thriving. Tucked away in a remote corner of the state of Maharashtra, far away from the gold rush of tiger sightings, trophy photography and pushy tourists, flourishes a forest that seems to thrive on the sidelines of mainstream conservation discourse of central India. Its very remoteness deceives to flatter as the Nawegaon-Nagzira Tiger Reserve has, despite enormous pressures, somehow managed to cling on to remnants of the vast ancient forest that had once adorned central India. However, this isolation is a double-edged sword as conservationists often miss out on schemes that could economically alleviate border villages and in turn reduce pressure on the forest. Swaying between modernity and ancient customs, from a negligible mobile network to an overdose of motorbikers driving west for better jobs, from dependence on traditional fuelwood collection to a sudden demand for gas connections, this is a park in flux. Strangely, its very name might be a deception as Nagzira ostensibly refers to a land where snakes thrived near water. However, even older legends claim antecedents from the old Sanskrit word Neg which referred to elephants and the etymology might have applied to elephants that lived near water. Nawegaon-Nagzira forms part of the Gaikhuri range and was part of the old Dandakaranaya, where forests thrived and indigenous people ruled for hundreds of years. Connected in the north to Pench and Kanha in a perfect triangle and the south to Tadoba and Gadchiroli forests, these forests have provided breathing space to animals migrating within these forests. The Kanha-Nagzira Corridor. Photo by Abhijit Dutta. But what sets Nawegaon-Nagzira apart from other parks in Maharashtra is a high percentage of migratory bird species, with more than 3600 small and big lakes spread throughout Gondia providing a safe refuge to birds that make their temporary home in the region. About 60 percent of all birds found in Maharashtra are found only within the Navegaon landscape. Even the sarus crane was known to migrate in large numbers earlier and are still found further north of Gondia town. Interestingly, the forest has a much higher rainfall as opposed to other parks in the Vidarbha. As a result, species and ecosystem diversity are high. Slender loris, mouse deer, and banded krait are some vulnerable species known to have been found at various times in these forests as the remoteness has continued to provide refuge to wildlife since time millennia. Oddly, its very remoteness is a cause for hope and despair. Hope, as infrastructural development in the region is comparatively minimal and despair as an increasing population pressure keeps the park under threat always. Despair, because mega developmental schemes such as India’s third-largest power plant run by the Adanis at Tirora producing more than 3300 MW of power can come up without much opposition within a few kilometres from the park boundary. Despair also, as ignorant villages may soon begin to suffer from the many health-related miseries of being neighbours with a giant power plant. And despair, as civil society protests are still not strong enough to ensure that the polluter pays to the villagers as well as to the forest over which the plant’s giant chimneys looms like twin angels of death. At the Nawegaon-Nagzira National Park. Photo by Kunal Sharma. Another threat that is on the ascendant is the short social fuse amongst villagers. In a trend that is replicated across most forested regions in India, the patience of the local populace about crop damage has run dangerously thin. Consequently, these villages tend to take extreme measures to protect their croplands. A large number of wild boars, spotted deer and even nilgai have been known to die from electrocution as a result of rigging overhead power lines for fencing croplands. As the practice continues unabated, wildlife density in these border regions is reducing fast and, in many ways, getting pushed back deeper into the forest. But Nawegaon -Nagzira is not all about despair. The wildlife in this region has exceptional ecological importance as there are several cases of young tiger sub-adults who have used the existing corridors to migrate to nearby parks, possibly due to conflict situations or scarcity of space in the current landscape. Currently, there are about eight adults and seven cubs in Nagzira and two males and two cubs in Nawegaon. 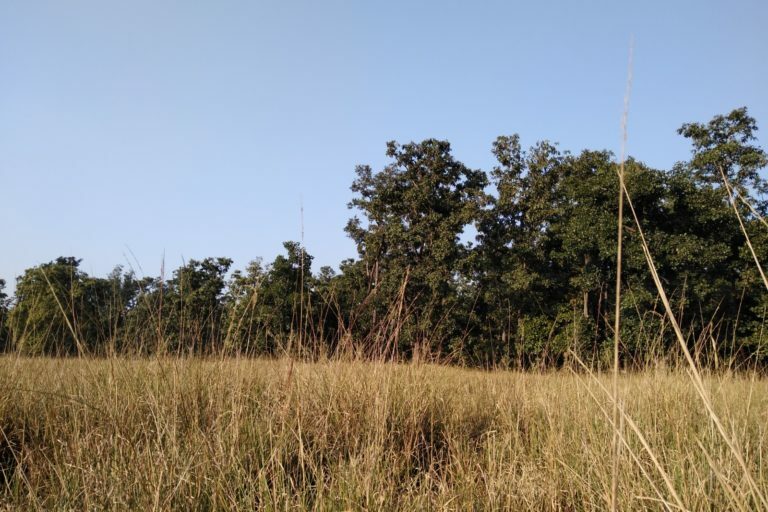 Though stressed, these forests have contributed to the successful dispersal of the local tiger gene pool through the many corridors that connects this region to the Central Indian landscape. 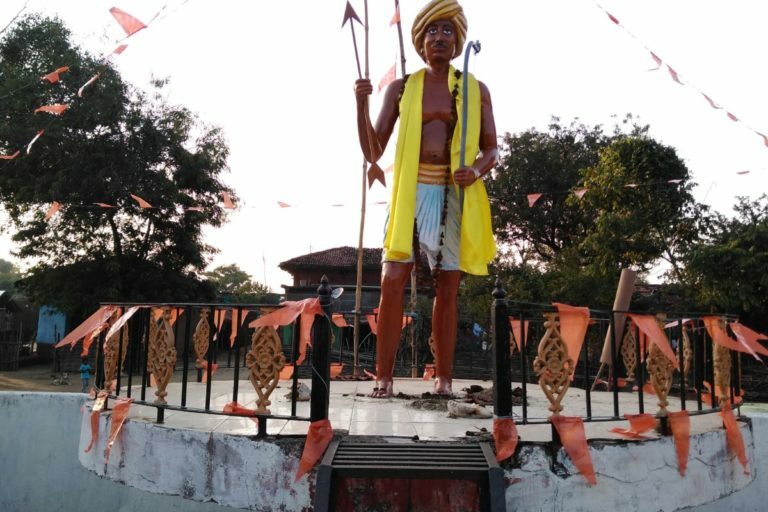 A statue of Birsa Munda, the Indian tribal freedom fighter, at Nagzira. Photo by Kunal Sharma. Another aberration that sets this park apart is the low impact tourism currently being practiced and in it lies an opportunity to develop scientifically valid ecotourism that can serve as a model for other parks in India. This is a rare example where nature trails are given prominence and facilities exist for tourists interested in bird-watching. The number of gates is spread apart and the number of vehicles currently entering the forest is comparatively less intrusive. A concerted effort to develop Pitezari, Chorkhamba and Mangezari gates in Nagzira and Jhambdi gate in Nawegaon with nature trail and trekking options should bring much-needed revenue to these regions. Even a sustained focus on developing homestays instead of high-end resorts could bring in some revenue to the local population. With more than 100 villages surrounding both the parks, a railway line between Gondia to Chandrapur with 50 km of tracks within forest areas, National Highway 6 from Mumbai to Calcutta which cuts through the forest for more than 40 km from Sakoli to Deori, a massive power plant, grazing pressures, stray incidents of poaching and fuelwood collection, the park has to undergo a daily fight in order to survive. Additionally, locals fear that schemes like the Samrudhhi Mahamarg might be initiated to connect Jabalpur to Hyderabad and may cut large swathes of the reserve. 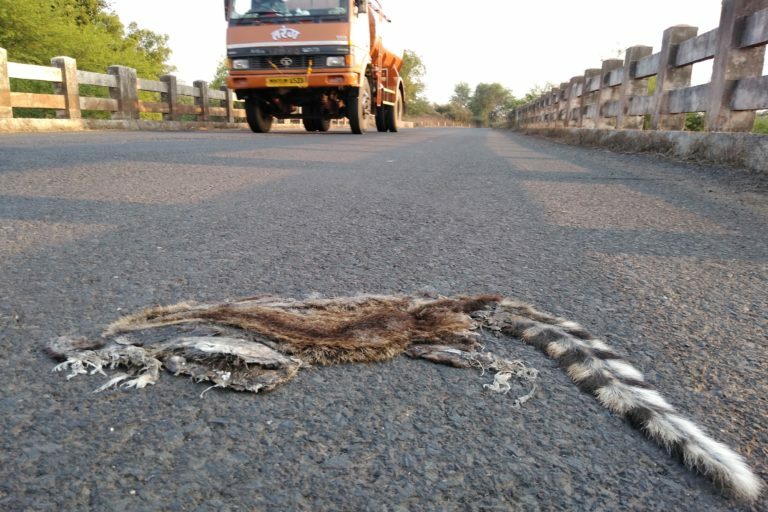 Roadkill near Nawegaon. Photo by Kunal Sharma. However, these forests which are critical offshoots of vast forest landscapes need to overcome these obstacles. The best hope for the 653 square km large Nawegaon-Nagzira perhaps remains in its obscurity and the fact that it remains relatively unknown to most of the ‘developed’ world, tucked away in a corner of the earth and without significant mineral wealth. Sometimes, the best solution for forests is to let them remain and basic protection be provided, for, in the long run, nature knows her duty well and any landscape that is accorded protection tends to bounce back. Perhaps Nawegaon-Nagzira will do the same. Banner image: The landscape at Nawegaon-Nagzira. Photo by Kunal Sharma.